Plasmopara obducens doesn’t sound like somebody you would want to invite for dinner and truly it is not. I talked in the last issue about the rapid decline and death of Impatiens. My original thought was a bacterial infection but greater research and discussion with colleagues would seem to confirm the presence of a Downy Mildew, Plasmopara obducens, that is very specific to Impatiens walleriana, the common garden Impatiens that we all grow in great quantity. It spreads rapidly by wind or water splash and is totally fatal to any infected plants. It is being reported in ever increasing numbers, particularly in the Eastern half of N. America. Trying to treat infected plants is basically a waste of time and energy. It is similar to but not truly a fungus and therefore many common fungicides are ineffective and, at least in Canada, most of those chemicals are not available. Clean up and discard all infected plants and do not plant Impatiens in that location for a few years. Plasmopara produces two types of spores and one of them lives in the soil for a couple of years. If you are growing in containers, you could replace the soil but that will not stop the air borne spores from finding their way onto your plants. 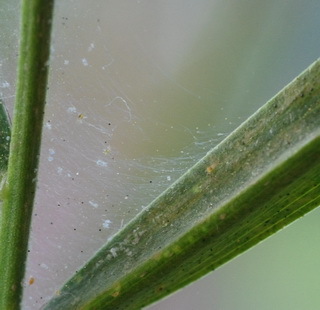 The underside of infected leaves will be covered in tiny white dots that are the fruiting bodies of this pathogen. It will be interesting to see if the massive market for Impatiens will rapidly disappear as both producers and consumers try to avoid having their crops suffer rapid and complete collapse. On a happier note, I’ve promised to keep reporting to you on things that I am trying. 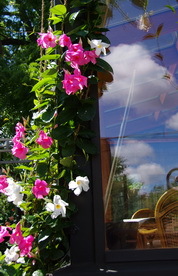 The Mandevilla that was set by the corner of the solarium and connected to the gutters above by some strings, has been a very successful experiment. It is in a self watering container so keeping it watered all summer was a bit easier and that allowed it to support the significant growth that this vine is capable of. We are now approaching the end of the summer and many of the vines have reached the top of the strings, providing us with a great display of their large pink and white flowers. They are visible from both the inside of the solarium and from the garden. There are two colours of flowers because there were two different varieties of Mandevilla planted in the container that came as another of the great trial plants from the Loblaw’s garden centres. I’m not sure what I will do with this plant in the fall. Last year I tried to overwinter one indoors and I wound up throwing it out midwinter because it had become a huge spider mite breeding farm. If I bring it in this year, I will make sure that it has undergone the significant spray program that all of my part time houseplants receive, for a couple of weeks before they come in. Those nasty little mites are very prolific and have a four day life cycle. That means spraying them every two or three days for a couple of week to make sure you kill all the adults and the newly hatched nymphs before they get a chance to mature and lay the next batch of eggs. I have my lovely dwarf date palm outside on the deck, getting a similar treatment. It was supposed to be a full time houseplant until I discovered the webbing and wildlife on it a couple of weeks ago. My major renovation of the two big Asparagus beds is now complete and my body is slowly recovering. I started because the weather had cooled for a couple of days. That didn’t last! I have lots of reclaimed Iris rhizomes planted where they should thrive in the reduced competition and many friends have happily acquired my surplus. While working on the second bed, I had to stop a couple of mornings and take the hoe to the first bed. Loosen up the soil and a add a bit of fresh moisture and be prepared to be amazed and depressed by how many and how quickly fresh weed seeds can take over those ideal locations. I have not as yet mulched these freshly cleaned beds but I may have to do that soon. My favourite mulch, chopped coconut shells, does not seem to be available anywhere this year and I’m just not that fond of the Cedar mulches that have the bigger chunks mixed in because they persist long after the finer particles have disappeared leaving you with bits of wood mixed through the soil. As we wander into September, where the days are supposed to be cooler and more pleasant for gardening, it’s time to start thinking about one of my favourite groups of plants, spring flowering bulbs. I can spend all winter anticipating the early thrill of Snowdrops and bulbous Iris, followed by the blast of colour from the vast array of Tulip varieities that are available. Start wandering through your favourite garden centres looking at the colourful displays of bulbs that you can plant this fall, to get those magical moments next spring when all of that colour bursts forth with no effort on your part. All of the effort is done in the slower cooler days of autumn and the anticipation will keep our gardener’s souls alive throughout the cold months of winter. Don’t be in a hurry to plant them after this long hot summer. Give the soil a chance to cool before tucking them in. I’ll write more about them in upcoming issues of Dallying In The Dirt, I just want to make sure you get to the stores early enough to get the sought after new varieties. One of the most pleasant days we get to spend as garden writers in our little corner of the world is the Loblaw’s / Stokes’ tasting day. We wander down to the trial grounds at the Stokes Seeds’ farms and eat our way around the varieties on offer. The Loblaw’s stores, one of the largest grocery chains in Canada, runs promotions for its vegetable plant varieties in the spring. They are always looking for new varieties to feature in their Insider’s Report and they are foolish enough to assemble a group of garden writers to help them with their selections. The main feature of this group is their diversity of tastes and that makes the search for consensus on any new variety a very frustrating activity. This year we were given a preview of a thing called a “Mighty Mato.” Although not a particularly new idea in the growing of greenhouse Tomatoes, the introduction of grafted Tomato plants to the consumer market is a very new concept. 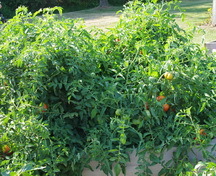 These plants have standard and recognizable varieties of Tomatoes grafted onto a special rootstock that should greatly increase yield, earliness and size. One of these plants in your garden might be enough to supply all of your Tomato needs for next summer if you give it enough room to do its thing. I’m looking forward to trying one and am planning the 1 m sq (3 - 4 sq ft) of space it may require or the 1.7 m (8ft) tomato cage to accommodate it. After trying all of the varieties in the field and in a delightful lunch we finished with a wonderful local Peach Pie and a very sweet, small Melon that will probably be in the Loblaw’s program next spring. Did I mention the samples of the student’s work from the Niagara College wine makers course? Time to answer a few questions. If you have a gardening question just ‘reply’ to this newsletter and send me your query. I try to answer most of the questions and the ones that I answer here are those that I think will have the widest interest. 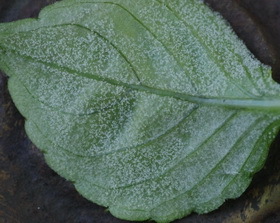 You can also find the latest garden updates on the front page of gardening-enjoyed.com . Dan Asks? Last spring my lawn was almost completely destroyed by Crain flies. I treated my lawn with GrubEX with good results. Should I apply a second application now or later this summer? Next -Currently what is left of my lawn is mostly annual fescue's I am, planning to thatch my lawn and reseed in late September. Would you recommended this approach? Ken Answers! Crain flies lay their eggs about now and they hatch in a couple of weeks but do little damage until they wake up in the spring. If you see adult flies around your lawn, let it get as dry as possible, (to about 2 -3 “ deep,) as this will kill off many of the eggs. Reseeding in late Sept is the perfect time. Apparently Rye grasses are more resistant than other types and there are several good perennial rye that make a fine lawn. Chris Asks? I look forward to hear more about my Zone 4 plants and animal prevention techniques to safely prevent critters from eating everything in site. We have deer and wild rabbits all year so any advice in your newsletter would be welcome. Ken Answers! Rabbit and a few of your vegetables would make a nice stew but that may not be a practical solution. Both rabbits and deer can be voracious eaters. Start to very carefully read plant tags on perennials, they often indicate which ones the deer do not prefer. Big, tight and expensive fences appear to be solution around defined areas such as a vegetable garden. Keeping the deer out is probably more important as they can devour much more in a short period of time than the rabbits. I have twice observed a rabbit in my garden, eating weeds. I’m hoping that this is a new variety that will be most welcome. Tillie Asks? I have about 9 false spireas, shrubs, in an exposed windy location, in sandy soil. I planted then Fall 2010 I think, so this is their 2nd summer with me. The drought and warm winds have caused them to drop many/most of their leaves, and they are looking sad. Usually, I prune my other older false spireas hard each spring, to the ground, and they resprout nicely. I have recently cut back other perennials that have bloomed and/or that suffered too much this summer, and they are resprouting already. Do you think my false spireas would appreciate pruning back to several inches above the soil line, or just leave them alone? Ken Answers! I would cut them back now. The garden will look better and it will save you doing it in the spring. 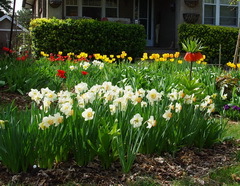 They may start to regrow as the weather gets cooler but that should not hurt their spring growth. Susann Asks? Just one question for you. My Rose of Sharon bushes are almost finished flowering, can I trim them down about 3 feet now as they are very weak and falling over! They aren't spreading out, just getting taller? Ken Answers! The standard rule for pruning flowering shrubs is to do it just after they have finished blooming. That way you don’t cut off any developing flower buds. By that rule, now is good. 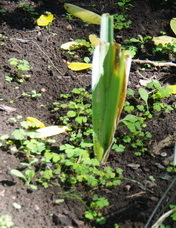 Go ahead and chop your Rose of Sharon and then the flower buds will develop on the new growth that develops next summer.